The seasons are changing and the color is popping out on the Fall leaves. It will soon be time here in Soddy-Daisy, TN to prepare for the upcoming winter months. Fall is here, and the first days of cool temperatures have arrived. What a beautiful time of year, to see all the changes in the foliage all around us. The surface areas of our homes also tend to change with the coming and going of seasons. Over time, the changing weather can cause the paint on our homes to begin to peel or fade away. Have you taken a good look at the exterior of your home lately? Is it time to repaint it or do you need some siding or surface repair? It may be time to put away the fishing or hunting gear and plan on doing a few home improvement projects around the house before winter hits the area. You will want to make sure that the bugs and insects don’t find their way in through cracks or crevices in the exterior of your home. Resealing and repainting play a big part in keeping the bugs out of the walls. When a home needs repainting, it tends to blend into the neighborhood and look dull. If you want your home to look outstanding, give our professional painting contractors a call today. We will work hard to make you smile and be happy with the results. When your painting project comes to an end and you take a look at the results, we want you to be happy and willing to recommend us to your friends and family. That’s why we take great care to give our customers the satisfaction they deserve. 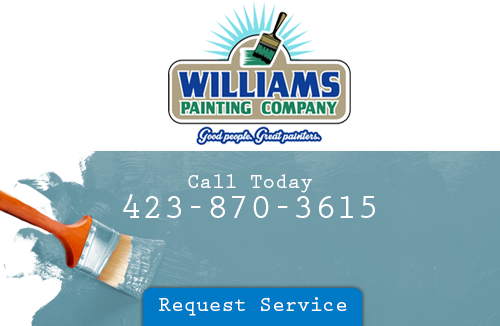 If you are looking for a professional painting contractor in Soddy-Daisy Tennessee, call Williams Painting Company LLC at 423-870-3615 or complete our online request form.